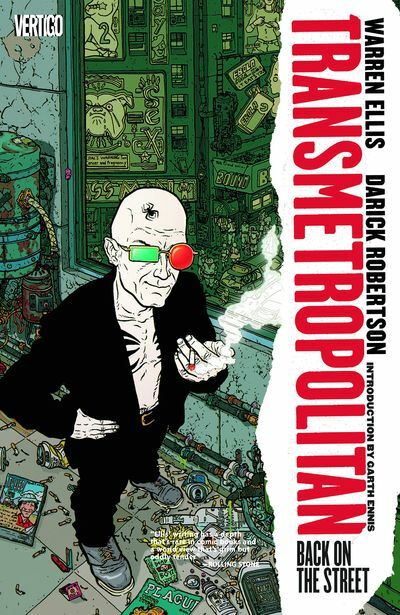 Transmetropolitan finally made it to the top of the Poll List! The G-Crew discuss the cyberpunk comic book classic Transmetropolitan Vol. 1: Back on the Street by Warren Ellis and Darick Robertson. They also sidetrack the show to rail against intrusive ads and time clones. Enjoy! DCollecting issues #1-6 of the acclaimed Vertigo series from writer Warren Ellis and artist Darick Robertson! After years of self imposed exile from a civilization rife with degradation and indecency, cynical journalist Spider Jerusalem is forced to return to a job he hates and a city he loathes. Working as an investigative reporter for the newspaper The Word, Spider attacks the injustices of his surreal 23rd century surroundings. In this first volume, Spider ventures into the dangerous Angels 8 district, home of the Transients - humans who have decided to become aliens through cosmetic surgery. But Spider's interview with the Transients' leader gets him a scoop he didn't bargain for. And don't miss Spider's first confrontation with the President of the United States... in a men's room.